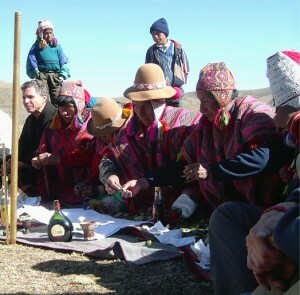 According to legend, when the Q’ero first appeared at the feast of the Collor Riti wearing ponchos emblazoned with the royal emblem of the Sun, and aisle parted in the thousands gathered and the elders of the medicine people welcomed them, saying, “We have been waiting for you for five hundred years.” They are the Inkas, the last original descendants of the Children of the Sun, and they have returned to deliver the prophecy entrusted to them foretelling of the End of Time. But they have also been the keepers of a body of processes, of rites of passage that usher in who we are becoming as a people and a planet. For the Inkas, the coming “Pachakuti” means the possible end of the world as we know it. But while presenting the possibility of annihilation and return to chaos, they also promise the emergence of a new human at the end of this turmoil. They announce the beginning of a millennium of gold on the Earth. Even more important, for the medicine people the prophecies speak about a tear in the fabric of time itself. This presents an opportunity for us to begin defining ourselves not by who we have been in the past, but who we will become 10,000 years from now. In the videos below, Shaman Jon Rasmussen describes the history and philosophy of the Q’ero shamans and how their modern lineage is working in the world today, and how it applies to the prophecies and current state of humanity. Recently in Peru, I was privileged to be present for a new reading of world prophecy by the Q’ero elder shamans (descendants of the Inka). The last time it was read was about 10 years ago and they spoke of the great and rapid changes coming to the Earth. They spoke of the floods, earthquakes, fires, etc. that would herald a time of great transformation for the Earth and all of its inhabitants. They say that there is tremendous upheaval happening on all levels: physical, emotional, and energetic; and now we are faced with an evolutionary leap in human consciousness, and now is the time to choose how we make that leap. Now is the time for individuals to leave behind the victim consciousness that has brought the human species to its knees and to the brink of destruction and step into the free and empowered consciousness of co-creators. And as more and more deliberate individuals such as you make this evolutionary leap a critical mass is reached and the entire human species is pulled forward all at once. Prophecy is not something that happens to us; we must make it happen. We are the ones we have been waiting for. To play and active and deliberate role in the bringing forth of a world destiny can be far more enjoyable and graceful than just helplessly waiting for it to happen and hoping not to suffer through it. 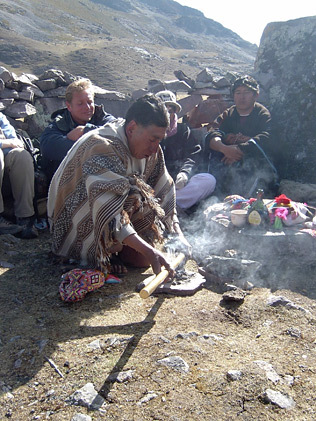 This is why the Inka (Q’ero) have come out of 500 years of isolation to teach the westerners their techniques for attaining full empowerment and freedom. This is the reason for the work that I am doing hear as a western Inka Shaman. We are doing this work not only to grow corn but to grow Gods. It is a choice each and every individual is making, consciously or not. If you are reading this, there is a good chance you are making this choice consciously and I would encourage you to continue your journey of empowerment and freedom and I will show up to help you in any way that I can. The elders spoke of the transformation of the human species that has already begun and is well under way. It is called the Pachakuti – “the world turning upside down”. 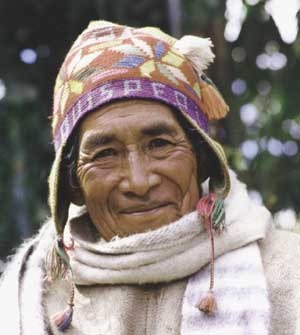 The first Pachakuti for the Inka is when the Spanish Conquistadors came over 500 years ago with their “Western” ways which were literally backwards or upside down compared to the sophisticated Earth/feminine-based societies that made up the Inka Empire, as well as the other great cultures of the Americas. That was also prophesized at the time. The current Pachakuti that the Western world is experiencing now is the returning to a way of living that is right side up so to speak. The elder shamans say that Homo Sapiens are becoming extinct, and that we are becoming Homo Luminous; and that we are the ones we have been waiting for. This matches the prophecies of all the medicine peoples of the Americas, North and South. For example, the Maya say that real humans won’t even be here on Earth until 2012; which makes us a kind of proto-human / experimental; but that it is up to us to call that human in. They emphasized that the time to choose is right now (not 2012). That there are those who will choose and bring in the new way of Homo Luminous by embarking on the healer’s journey of full empowerment and freedom now, so that they can step beyond the influences of a culture based on fear, violence, greed, and the slow death that stalks us everyday. Once beyond those influences, we are ready to step into our full power as co-creators. It is a wonderful opportunity and time to be alive. We are here to witness the a re-balancing of the Earth and all of creation; and play a role in that re-balancing according to our desires, whether they are conscious or not. Us Westerners have the opportunity to return to the Garden where all the primary peoples have never left; and we can do it in a way that is beautiful and graceful if we choose. Imagine being able to communicate with all conscious beings, the animals, stones, plants, etc. and live in greater harmony; assisted on all levels to obtain a life of joy and exhilaration, free of the necessity of struggle and suffering. Those that are choosing to clear themselves of past and present influences and step into their full power and freedom through shamanic energy medicine are becoming part of a collective of human consciousness that upon reaching a critical mass will cause an evolutionary leap in consciousness for all humans. Scientists have discovered that this is how we have evolved in the past, by steps or leaps. This is often referred to as the 100th Monkey effect, which has been scientifically proven for humans as well as other species. The shamans say that we will know that we are fully healed in our power and free, when nothing anybody says, does, or thinks, triggers us out of our joyful state for more than a few seconds – creating the possibility of true unconditional love and kindness beyond the grip of fear and anger. Imagine not having to waste energy engaging or recovering, and instead being able to use it as deliberate co-creator, appreciating even the contrast in life for the clarity, desire, and life force it brings forth. I will leave you with this paraphrase from the teachings of Abraham – The purpose of life is joy, the result is expansion/growth, and the basis is freedom/free will, but the purpose is joy. The shamans say that the Universe makes you right – so that whatever you choose to believe (your working hypothesis), you will continue to find evidence to support it. So, why not make your working hypothesis extraordinary. Don Manuel Quispe, the 99 year old Inka legend, has returned to the Mountain. He passed away in his sleep on December 11, 2004. Don Manuel was a contemporary of my mentor’s mentor, don Antonio. They both shared a vision that said that the new shamans, the new caretakers of the Earth, would come from the West. With his passing, the mantle of stewardship has been handed over to us, to dream a world into being where our children can live in peace, where nature thrives, and where the rivers and the air are clean. Please join me in celebrating the life and final journey of the last Inka, and to remember that we are here to not only grow corn, but to grow Gods.